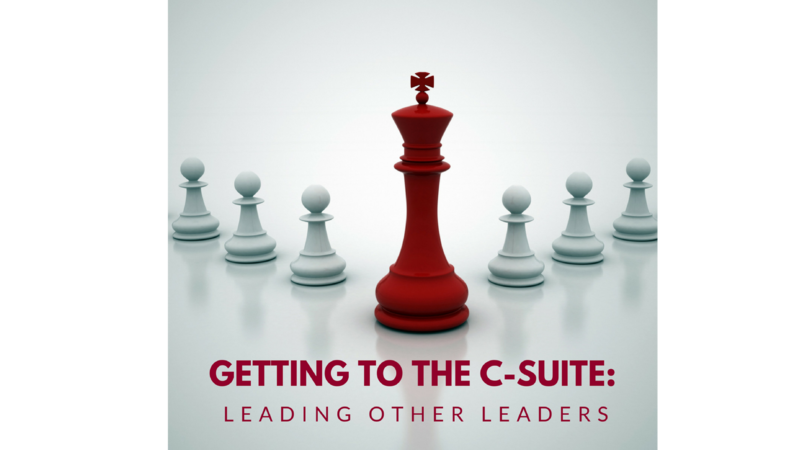 To obtain a seat at the C-suite table, you must be able to lead other leaders. Leadership is a relationship business, and relationships are built on trust. Trust is built on communication and action with integrity. Leaders of leaders inspire the best performance from individual people and teams in support of organizational outcomes. Being a leader of leaders requires flexibility, trust, influence, communication, and confidence. Leading other leaders is as much an art as a skill. As individuals grow in an organization and in leadership ability, they often lead people as smart as or smarter than themselves. For these leaders, keen observation and listening skills provide the perspective needed to learn how to bring out the best in co-leaders. They gain insight about the strengths of those they are leading and influencing. They understand the approaches and environments that promote the highest levels of engagement. Leaders of leaders adapt their own styles accordingly. They have developed an exquisite ability to put themselves in the other person’s shoes and meet others where they are. They communicate in a way that allows others to receive the message best, thereby promoting understanding and connection to the broader vision. With confidence, they encourage their co-leaders to take the reins, play big, talk straight, and act boldly. Leaders in the C-suite know that their success depends on the success of others and therefore are committed to their coleaders’ development and accomplishments. Provide vision and communicate the connection to the broader strategic context. Provide leaders with the opportunity to contribute to strategy. Ask questions and seek input and perspectives from other leaders within the team and across broader groups. Listen to understand versus wait to respond. Seek alternative points of view. Search for ways to remove silos and promote collaboration. Encourage change to emerge, and empower other leaders to make the change. Encourage a culture of constructive disagreement and the sharing of diverse points of view. Support the success of others, particularly at the peer level. Communicate, communicate, communicate in ways that others receive the message best. Successful C-suite leaders are purposeful, broad-based thinkers with clear points of view, yet they are open to alternative ones. They are skillful in bringing the power of the entire organization to challenges and opportunities. They are nimble and unafraid in their approach to change. Most importantly, those in the C-suite inspire action and invite the best from their fellow leaders.